Has websearch.searchtotal.info taken over one or few of your web browsers? This malicious browser hijacker does not need permission to enter your operating system, and, even though some users might agree to install it, it is most likely to come without invitation. This should be enough to realize that this is a browser hijacker that deserves immediate removal. Unfortunately, there are plenty of users who do not see a point in deleting websearch.searchtotal.info. The point is that your virtual security will be at risk until you remove this hijacker from your browsers! Read our report to learn more about this. 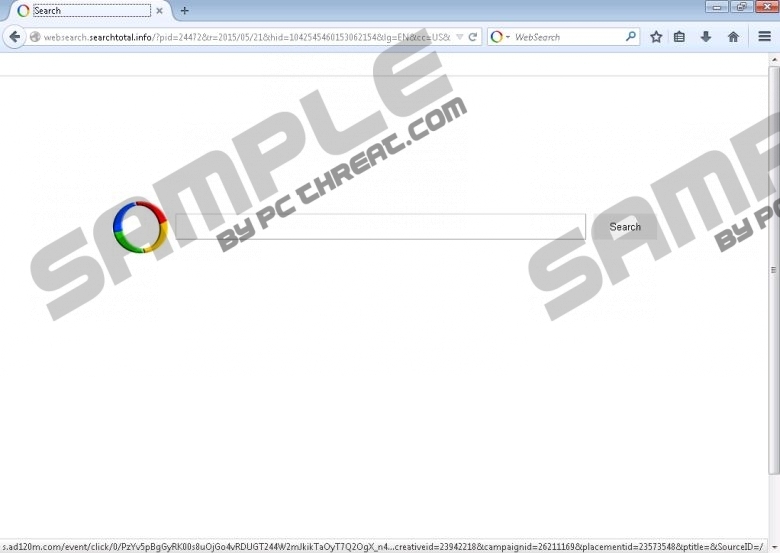 Websearch.searchtotal.info is usually identified and removed as the Websearch Hijacker. This name is also associated with Websearch.seekplaza.info, Websearch.searchero.info, and hundreds of other infections. These threats not only share similarities in their names, but also in their interfaces and their functions. In fact, there is a reason to believe that websearch.searchtotal.info and its clones were created by the same schemers. We believe that these hijackers were created by schemers, because they do not work as reliable security tools that they claim to be. Needless to say, we urge users to remove all Websearch Hijackers, regardless what shape or form they appear on your operating system. The unreliable websearch.searchtotal.info cannot spread by itself. Instead, the installer of this hijacker is spread packaged with more attractive programs. Our researchers have found that the distributors promoting this hijacker could package it with ConvertApps, RockApps, and other ad-supported programs that we recommend removing, as well as PUPs and clandestine computer infections. Due to this, you should not trust software bundles, especially the ones represented via corrupted ads placed on unreliable file-sharing websites. These ads could promote completely fictitious Java or Flash updates, and if you download them, you might have to delete websearch.searchtotal.info or its clones. The main reason why computer users often postpone the removal of websearch.searchtotal.info is the search results it provides. Instead of presenting clearly unreliable search results showing corrupted links, websearch.searchtotal.info redirects to Google Search. Needless to say, it is not an unreliable search tool; however, we do not recommend trusting it when it is presented by websearch.searchtotal.info. If you enjoy the services provided by Google, you can remove websearch.searchtotal.info and replace this browser hijacker with google.com. We show how to do this in the instructions below. Even if you ignore the suspicious search tool and the ads that it injects, you will not be safe because of the tracking cookies installed alongside. You must remove these cookies because they could collect personal data. There should be no more questions whether websearch.searchtotal.info deserves removal because it certainly does. Now is the time to raise questions about the removal methods that could help you delete this hijacker in the quickest and most efficient way. The instructions below can help you replace the undesirable search tools with the preferred ones, but it is unlikely that this will be enough to delete websearch.searchtotal.info components, including tracking cookies, or other threats. Leave this job to a reliable malware removal tool that will also help ensure reliable protection in the future. Select Internet Options and click the General tab on the left. Find the Home Page URL, overwrite or delete it, and click OK.
Open the Tools menu again and select Manage Add-ons. In the menu on the left select Search Providers. Add the preferred search provider, select it, and click Set as default. Click Options to find yourself in the General menu. In the menu on the left select Search. Go to Default Search Engine and choose your default search provider. Identify the undesirable search provider, click it, and select Remove. Select Settings to open the chrome://settings/ menu. Click Set pages and delete the undesirable startup page. Click OK.
Click Change and remove the undesirable home page. Click OK.
Identify the preferred search provider, move the cursor over it, and click Make default. Click X on the URL of the undesirable search tool to remove it and click Done. Quick & tested solution for websearch.searchtotal.info removal.